Generac Mobile® has launched the market’s first dimmable and ultra-thin external mobile disk light. continues to lead and redefine mobile lighting solutions. The new products is focused on the understanding and importance of light in assisting productivity. With this new product, we are supporting Health and Safety with anti-glare lamp heads and portable tower. Available on road tow or on a trolley platform, the Generac Mobile® MT1-UFO model provides an impact resistant and robust entry level lighting tower suitable for rail and infrastructure projects. Launching this September, the curved opal cover of the MT1-UFO creates a thin and strengthened disk which provides total 360˚ strong, but soft light, powered by 400W LED lamp heads incorporating a unique passive cooling system. The passive cooling technology creates a maintenance-free lamp head due to an aluminium element which dissipates the heat. The lamp head provides two solutions in one with complete 360˚ light and the ability to tilt to provide directional light. The MT1-UFO was designed with safety in mind and offers a safe alternative to balloon lights or temporary onsite soft lights. The MT1 Yanmar engine delivers performance for up to 34 hours of operation at full capacity and provides light up to 25m. The lights are dimmable from 1 to 100%, without compromising on quality, making it suitable for track and road side maintenance in busy urban areas or on high traffic flow road networks as there is no glare produced. The launch of the MT1-UFO this autumn is further accompanied by an evolution of the Link Tower (T3) trolley light- a third generation of this popular mobile light solution. 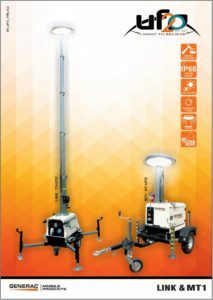 The ergonomic and easy to use manual system of the Link T3 ensures that the 6m rotating mast can be easily deployed and positioned, while the 150W crisp and instant LED lights provide strong visibility. It is equipped with stabilisers, double access lockable doors for storage of tools, and safety lock-in pin which makes this a versatile, safe and secure portable tower. The Link T3 model also includes an updated control panel and is available as option, with an astronomical digital timer for start/stop functionality and a darkness sensor which allows teams to arrive safely on site with light already provided thus allowing them to start work immediately. Both MT1 UFO and Link T3 models can be ‘daisy chained’ to provide good fuel efficiency and lighting in confined areas such as tunnels. The MT1 UFO model with 32A socket and plug, can link up to 12 machines powered from Mains supply. The new tower lights are available now from Generac Mobile® and our Dealers across the world.